There is a ton of research on babies and sleep, but one thing for sure is that sleep looks very different from family to family and that’s okay. While it is crucial for your baby to get the appropriate amount of sleep in a comfortable environment, don’t feel too pressured if you’re not going by all the rules. Here is a guideline of what sleep looks like during the first year of life, and some tips I wish someone would’ve shared with me sooner. Your baby will sleep what feels like most of the time! They should get anywhere from 16-18 hours of sleep but many newborns sleep even more; half of this will be during the night and the other half will be stretched out across four naps. Newborns have small stomachs and digest fast, so your baby will need to be fed every 2-3 hours, and yes you will be exhausted, but there is no need to wake your baby to eat (unless recommended by your pediatrician to ensure weight gain). Your baby won’t be able to tell day from night because they haven’t developed a circadian rhythm yet, so it’s important that you help teach them when to sleep. Provide a comfortable and safe environment for your baby to sleep in with appropriate bedtime lighting. It’s never too soon to teach your baby sleep language, so let them know that it’s time to go “night-night in your crib,” or what have you. Your baby should be sleeping 15-17 hours per day with 8-10 of those hours at night and the rest of the time stretched across three naps. 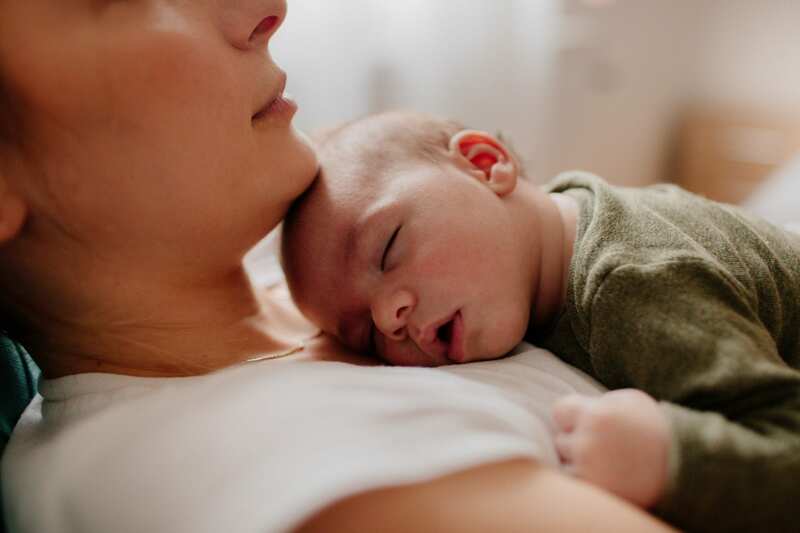 Although it is important that you hold your baby and love on them as much as you want, by week four you should get into the habit of putting them down while drowsy and awake for at least one of their naps. Between six and eight weeks, you should have a more established bedtime routine. If you are nursing your baby to sleep, rocking your baby to sleep, playing music, etc., remember that this will be a part of your baby’s routine that will be hard to break later on, so start teaching your baby how to sleep early on! Your baby will have a bigger stomach and sleep in longer intervals of four or more hours. Your baby should be getting 15 hours of sleep with at least 10 of these hours at night and the rest stretched across three naps throughout the day. Your baby may sleep a little less than 15 hours with two long naps of 90 minutes or more, and one shorter nap in the afternoon. Your baby should now already be able to sleep for 8 hours without eating. If they are waking up, just pat your baby’s back and use that sleep language; don’t feel bad for not feeding your baby in the middle of the night. Continue with your routine and you and your baby will sleep great. If your baby sleeps swaddled, this is usually the time to un-swaddle and have at least one arm out if you haven’t already. Your baby is able to sleep 10-11 hours straight at night, but most babies don’t. In fact, when people say their baby is “sleeping through the night” this could mean they are sleeping 5-8 hours at a time which is a milestone itself! If you haven’t already, it is advised that you cut out the mid-night feeds. Remember that a routine is key and car/stroller naps are only disaster naps; they are usually interrupted and outside of your routine. Your baby should still be sleeping 14-15 hours a day, but many babies cut back to two naps during this time. Your baby should still be getting the same amount of sleep but has most likely cut back to two long naps and 10-12 hours at night. Your baby is becoming more independent and may struggle to go to sleep as they’d rather spend time playing with their parents. My advise, don’t give in! Once you give in, all the hard work and routine building you’ve done will go out the door and it’s difficult to start that all over again. Don’t allow your baby to wake up before 6am, and if they do, don’t get them until later. And while sleep looks different for all babies, your baby should not stay awake for more than four hours at a time as it leads to over-tiredness which makes it a struggle to fall asleep in general for many babies. Your baby should still be getting two naps during the day, but many cut back to one two-to-three hour nap by fifteen months. And if by 18-24 months your toddler is refusing to take a nap, try and continue having an hour-to-two of “quiet time” in the middle of day to wind them down and give you peace of mind. While your baby needs up to 15 hours of sleep on average during that first year and routines are essential, please use this as a support tool and don’t be upset if it isn’t what sleep looks like in your household; I have a twelve month old who still nurses for 5 minutes at 3am and that’s okay! Wishing you and your baby sweet dreams! American Academy of Pediatrics, Reduce the Risk of SIDS & Suffocation, January 2017. National Sleep Foundation, Children and Sleep, 2018. National Sleep Foundation, How Much Sleep Do Children Really Need?, 2018. WhatToExpect.com, Crying It Out and Sleep Training: What Parents Need to Know, January 2018.